Daniel Roest fondly remembers when he was 11 years old and first heard legendary Spanish guitarist Andrés Segovia perform at UC Berkeley. That moment sparked a lifelong passion and career surrounding classical guitar. 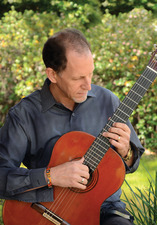 Now teaching both privately and at several colleges, Roest is the founding president and artistic director of the Sacramento Guitar Society and still manages to play at private events and local venues such as Bacchus House Wine Bar & Bistro. HLB: What about Segovia caught your attention? DR: After five years of guitar lessons, I knew enough to appreciate the magnificence and beauty of what my mom and I were witnessing. [Segovia] was genuinely pleased to greet me backstage and took my small hand in his, smiling. I immediately began lessons with his California-based protégé Bunyan Webb,in Palo Alto. HLB: What inspires you when creating music? DR: I’ve had a lifetime of training and practice. I started when I was six, and I’m older than dirt—kidding—but I’ve never stopped playing so it’s kind of my voice. I can express so much that can’t be captured any other way. HLB: Why did you choose to teach? DR: I learned that most great musicians are at least part-time teachers. Teaching has turned out to be immensely rewarding. I’ve done big college classes, adult education, high school and elementary, but private lessons are the best because you get to tailor your teaching to an individual. I’ve met so many great people along the way. HLB: What do you enjoy about your community? DR: Where to start—first and foremost, my wife and son are happy here. It has everything a growing family needs: beautiful urban planning, access to just about anything [in regard to] shopping and eating, really great educational institutions, the world-class Harris Center presenting the best entertainment coming to the West Coast, birds and oaks and a lake we can walk to, and some of the most wonderful people on the planet. HLB: How do you find that work/life balance? DR: They say if you do what you love you’ll never work a day in life. I love my work, but I have a mortgage to pay and my family and friends are getting older and I want to spend more time with them, so it’s a challenge to achieve balance, because I work a lot. Since I work from home, however, I see my family more than many dads do. We eat dinner together every day, watch movies with each other and stay very close. After they go to bed, I’ll practice and handle business until well past midnight. For more information, visit danielguitar.com.